What is Poetry? (Name that Text Type! series) by Trudi Strain Trueit (ARC provided via Net Galley, publication date Sept. 1, 2014). What is Poetry? is a new picture book resource for early elementary school. 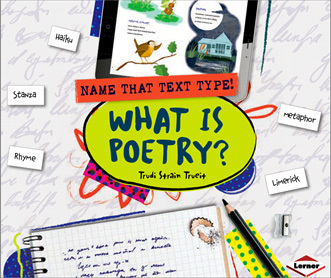 This attractively-done nonfiction book provides information about several basic poetry forms as well as example poems and literary devices. The book follows standard nonfiction conventions, including a Table of Contents, Glossary, and Index. The four major chapters provide an introduction to poetry, a look at some example poems, an overview of literary devices (including alliteration, simile, metaphor, and onomatopoeia), and finally a section on poetry forms. This book would be a useful resource for an elementary teacher looking to introduce students to some of the basics of poems and poetry. It could also be used independently by students, perhaps at a Writing Center encouraging an exploration of poetry forms or literary devices. This book would be useful for helping students grow in their understanding of poetry and in pushing them to try new things in their writing. This week's Poetry Friday Roundup is being curated by Robyn at Life on the Deckle Edge. See the whole list of hosts at Poetry Friday by Kitlitosphere. Glad to see you again! That sounds like a good book to have in the classroom. Thanks for sharing it! Thanks, Donna! Agree that it definitely has potential. I've read this too, Katie. I think it will be useful for a variety of reasons as you shared. So nice to have other books about poetry for kids coming out. Thanks, Linda. It's really amazing all the resources that are out there now. Thanks for sharing your thoughts about this book. Can't wait to get a copy! Thanks! Hope you find it useful! Nice! 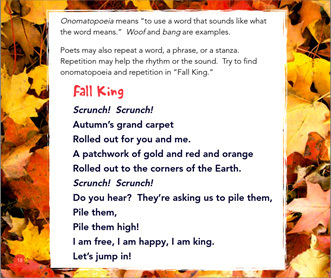 Great to know about a resource to make poetry more accessible. Thank you! Thank you, Irene! And again, thanks for hosting. Thanks, Bridget! This one is a great starter poetry book. Thanks for presenting this book. It looks like a kid-friendly resource. Thanks, Joyce! It does a nice job of engaging younger elementary readers.